The first lady IPS Officer, Kiran Bedi left her mark on the male dominant police force ever since she joined the National Academy of Administration in Mussoorie in 1972. The only woman in a group of 80 odd men she completed the six-month foundation course and went on to train at Mount Abu and then with the Punjab Police. Here are a few things about the badass woman who gave nightmares to outlaws. 1. Before she joined the police forces, Bedi was a national level tennis player. She won many titles in the junior level and professional tournaments such as Junior National Lawn Tennis Championship, All-India Hard Court Tennis Championship, and National Women's Lawn Tennis Championship. 2. As the Deputy Commissioner of Police, displaying valiance and presence of mind Bedi helped resolve a conflict between Nirankari and Akali Sikh communities in Delhi that had taken a violent turn. Her actions were praised and she received the President's Police Medal for Gallantry in 1980. 3. 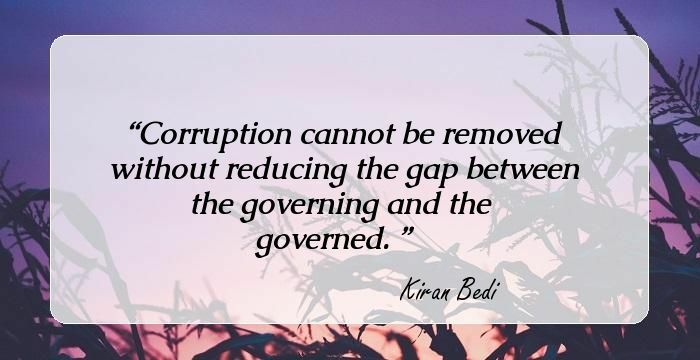 Bedi was instrumental in introducing reforms in the prison and her out-of-the-box ideas for combating outlaws and illegal liquor shops commanded respect from her peers. She worked by abiding the rules and without the fear of any politicians. She earned the nickname “Crane-Bedi” after she once towed the vehicle of Prime Minister Indira Gandhi for illegal parking. 4. She was awarded the Asian Jyoti Award for her exemplary management of traffic during the 1982 Asian Games. Bedi refused to accept and said it was not only her but the joint effort of the entire traffic police department. 5. For combating drug abuse she set up many detox and rehabilitation centers throughout the nation. 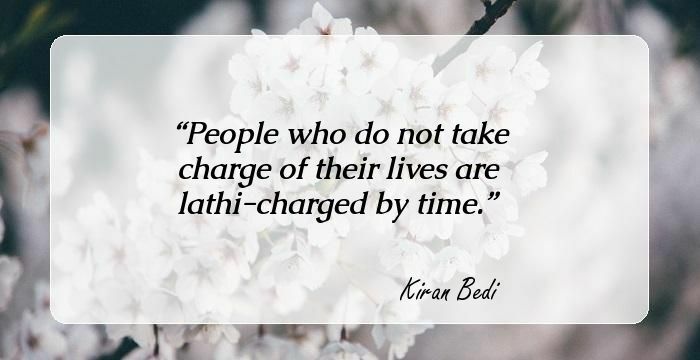 Bedi is also a co-founder of the Navjyoti India Foundation, a not-for-profit society. What is the value of education which does not inculcate passion and fearlessness for setting right what is wrong? Corruption cannot be removed without reducing the gap between the governing and the governed. What a national revolution it would be if each one of us were to self-police. We can start the change from own homes, neighborhoods, bastis, villages and schools. Bonding cannot happen without a strong shift in prevailing attitudes. I have always nurtured a zeal inside me to live and serve the underprivileged community. There are self-chosen exercises to move forward. Works gives me ‘JOY’ and every beginnings is a path of self discovery. Terrorism anywhere is a threat for humanity. My policing was nothing but activism - it had to be.